While there’s an ongoing debate about whether or not your cat should be let outside, there isn’t much debate on if your cat should wear a collar. The only discussion on this topic is what is the best kind of collar. There are a huge number of collars out there. They range from purely decorative to purely functional. Various features are available too: safety releases, D rings, embroidered name plates, metal name plates, personalization, etc. So which should you choose? This article is focused on finding the best personalized cat collars with safety releases (for more info on safety releases read below) out there today. Every collar in this article has a breakaway safety buckle and you can personalize it. This means you can add your cat’s name and info right to the collar before purchase! Why Should Cats Wear Collars? Will My Cat Really Wear a Collar? Why Only Collars With Safety Releases? What if My Cat Is an Indoor Cat Only? What if My Cat Has a Microchip Already? Ruggit has by far one of the coolest collars on the market in that it is both leather and it has a TON of customization options for you and your cat to choose from. Not only will your cat be safe, he or she will be stylish when out and about with the neighbors! There’s room for two full lines of text with 20 characters each, plenty of room for name and phone number. Unlike most leather collars, it actually includes a safety buckle! There are a bunch of size options from 6-10 inches ensuring it’ll fit your cat just right. This option is specifically marketed as a collar for cats that have escaped the house. This is part of the larger #KittyConvict project that is intended to help get more lost indoor cats home to their families. That being said it’ll work just fine for cats that are allowed outside, but you’d probably want another collar for outdoor cats just to avoid any confusion if people see your cat and think it is lost. You have two options here, you can directly personalize the collar or you can personalize the tag for the collar. Each tag allows up to 4 lines of personalized text, each line takes up to 18 characters of text. The tags are about 1 inch by 1 inch. There is only one color available, orange. It is used becuase it is bright and reflective and a single color is used to indicate the cat is outside and isn’t supposed to be outside. The collar is 3/8″ wide and adjustable from 8-inches to 12-inches in length. A safety clasp ensures that if your cat gets caught on anything they are released without any injury. These nylon collars are not only durable, but they look great too. On top of this they give you a lot of options from a personalization standpoint. As with all collars listed here it of course features a break away safety mechanism in case your cats gets caught on anything. They are made of nylon and canvas and will hold up to even the most adventurous cats. They are embroidered for long lasting good looks. You have room for up to 25 characters of customization. There are 5 options for the collar color: Blue, Black, Pink, Red, Purple. There are a total of 11 thread color options: White, Grey, Red, Orange, Green, Yellow, Light Blue, Blue, Black, Pink, Purple. The collars are adjustable for cats with necks about 8″-12″ and are 3/8″ in width. Each collar comes with a bell & ring to attach licenses, the bell is removable. This is one of the flagship products made by GoTags. GoTags is by far one of the most well known companies in the personalized cat collar business. It is a simple, but safe and effective safety release collar for your cat. The collar is made of no-snag nylon material so it is less likely to get caught on things outside. If it does get caught it has a safety release clip to let your kitty out without any danger. There are 5 different Collar Color options: Black, Blue, Red, Pink or Orange. There are 15 different Thread Color options: White, Black, Navy Blue, Red, Neon Pink, Baby Pink, Sky Blue, Purple, Neon Yellow, Neon Green, Orange, Gold, Turquoise, Cotton Candy, Jolly Rancher. You can add up to 22 characters to the collar to personalize it. GoTags has another option available that is completely reflective to ensure your cat can be seen in darker conditions. Given many cats go out exploring at dawn and dusk (they are crepuscular after all!) this is a great option for an outdoor cat. While the collar itself isn’t personalized, it comes fully equipped with a tag of choice to carry all your kitty’s info. Your cat’s ID is laser engraved onto a stainless steel pet tag, you can choose between a cat face or a paw print. Each tag allows up to 4 lines of personalized text, each line takes up to 15 characters of text. The tags are about 1 inch by 1 inch. There are 5 color options: Black, Blue, Orange, Pink, Red. DayDay Patch has recently released this collar which is loaded with bling. Not only is the collar itself shiny and sparkly, but it also comes with an awesome cat shaped safety release buckle for extra safety for your feline pal. They’ve also included a jingle bell for extra flair (Office Space anyone?) to make some noise and warm people your kitty is around. Cool cat shaped safety buckle and D ring for the personalized tag. Your cat’s info is lasered onto a stainless tag to ensure it lasts long and won’t wear and tear even in the roughest conditions. The laser engraving is clear, permanent, and attractive on a polished mirror-finish surface. The collar is 3/8 inches wide and adjustable from 8-inches to 12-inches in length. Another great option available from GoTags is this reflective collar set. you’ve got a wide variety of colors to choose from and of course the collar has a nice tinkling bell on it for additional sound to ensure your kitty can be heard as well as seen. The reflective strip is extremely visible even with just a little bit of light. It can be seen from 0ver 100 feet away. Your cats details are lasered directly into the reflective strip and you have a total of 25 characters of space to work with. The color of the lasering will appear black on all collars. 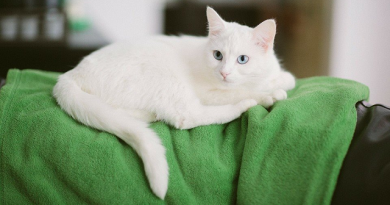 Your cat’s details are embroidered onto a piece of fabric that is then sewn onto the collar. You have a total of 25 characters of space to work with. There are 6 color options: Black, Red, Purple, Blue, Light Blue, and Pink. There are 12 different options for the embroidery: Yellow, Blue, Black, Red, White, Pink, Light Blue, Orange, Green, Purple, Brown, Blue. The collar also has a jingle bell and a D ring for additional tags or items you want to attach. If you’re looking for a high quality collar that is depended on by thousands then this is an excellent choice. Not only does it bring a wide variety of options to the table for you to personalize, but it is also a very reliable, safe, and well respected collar. The nylon webbing has smooth, tapered edges for a comfortable fit for your feline friend. The safety release clip ensures your kitty gets out of any sticky situations out without any danger. Looking for a basic tag that will just get the job done and don’t care about frills? These tags let you add your own personal cat information and they are made of stainless steel for durability. That being said, they don’t bring a lot else to the table from a personalization standpoint. What they do however bring is a wealth of community support on being some of the best tags on the market. They have over 15,000 reviews on Amazon as of the time I am writing this and an average rating of nearly 5 stars. If you want a verified and well respected product you can’t do better. 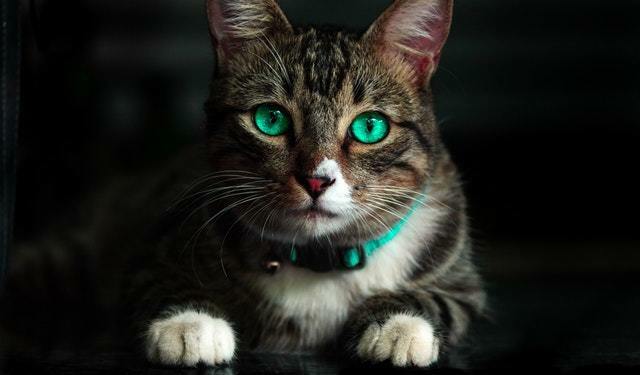 Some owners may already have a collar they love, or a collar their cat loves. That collar may not provide any details about your kitty though. If that’s the case you will probably want to add a personalized tag to your cat’s collar. Even if your cat has a microchip not many individuals have a scanner available. This means that tags are the fastest and easiest way for people to figure out who owns a cat and get in touch with the owner. Your cat’s ID is laser engraved onto a stainless steel pet tag that is made to last for years and years. The lasering looks black in the photos, but it will appear with a mirror finish. Each tag allows up to 4 lines of personalized text, each line takes up to 20 characters of text. Will easily attach to the D ring on any standard cat collar. If you’re looking for a little more creativity in the shape of the tags you stick on your cat’s collar then these are the tags for you! Each tag allows up to 4 lines of personalized text, each line takes from 16-18 characters depending on the shape you choose. Will easily attach to the D ring on any standard cat collar using the split ring included with each purchase. There is one simple response to this question. 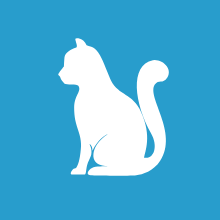 If your cat gets outside or gets lost a collar is the easiest way for someone to identify your cat and get in touch with you as quickly as possible. Collars are by far the easiest way for a fellow human to identify a cat and the owner of the cat. Especially if the collar itself is personalized with the cat’s information. There are also several movements among pet owners (for example the #KittyConvict Project) that make it easy for other cat owners to recognize a lost/escaped cat. This means fellow pet owners are more likely to make an effort to help return a clearly lost pet. Research shows that cats that get lost are far more likely to be returned to their owners if they have a collar on when they get lost. Many owners simply assume that their cat won’t wear a collar because they’ve mostly seen cats that don’t have collars on. There may be an adjustment period to get your cat used to a collar, but most cats will wear a collar if you as an owner insist on it. Research has shown that owner perception is the biggest indicator of whether or not a cat will wear a collar. Basically, if owners don’t think the cat will wear a collar then they simply won’t try to get the cat to wear a collar. But reassuringly, the most recent research shows that over 72% of cats wore a collar through the end of a study period. So if you are dedicated to getting your cat into a collar you can make it happen! There’s no specific trick to getting a cat to wear a collar. As with most things, it requires time and persistence (and in a lot of cases treats). You’ll want to introduce your cat to a new collar slowly and gradually expand the amount of time the cat wears the collar until they wear it all the time. Cats are climbers and explorers and like to squeeze themselves into tight places. Collars without a safety release can easily get caught on tree branches, splintering wood, a hanging nail, etc. There are a laundry list of things a collar could get caught on in the wild, or even inside the home. If a collar gets caught on these objects and doesn’t release easily then your cat could be seriously injured, trapped, or even strangled. Enter safety clasps, buckles and releases. There are also the more uncommon elastic straps that serve a similar purpose, but aren’t as highly recommended these days. All of these are designed to ensure your cat has an opportunity to get out of an otherwise dangerous situation. The short of it is, collars keep your cat safe if they get lost, but safety releases bring an extra layer of safety if they get stuck on something while out and about. Many cat owners don’t encourage their cats to wear collars because the cat is “indoor only.” The unfortunate thing is that the bulk of cats that get lost and don’t make it back home are cats that escaped from an indoor only life. They may have snuck out the door or been spooked while the front door was open and simply scampered off. Most indoor cats will get outside at some point in their life so a collar is a great added layer of safety. Unfortunately you can’t put a collar on your cat once they are already out the door. Indoor cats should have collars on even if you never intend to let them out. What if My Cat Already Has a Microchip? Microchips are one of the most effective tools ever created in tracking pets and ensuring they make it home to their owners when lost. However, microchips aren’t something that an average individual can scan/read. And many people, non pet owners in particular, aren’t even familiar with their existence. The Humane Society recommends that even microchipped cats wear a collar with tags or identification included. This means that for the microchip to be useful your cats has to make it it to a veterinarian, shelter or animal control center of some sort. Added steps mean added complexity and every additional step means your pet is less likely to make it home to you. Now don’t get me wrong. I highly encourage you to mircochip your pet. It is an absolute necessity. But a collar will be something almost any person can read and use to get in touch with you the second they encounter your cat. Average collars tend to measure between 8 and 12 inches for an adult cat. This will easily accommodate most cats out there, but for those of you with smaller or extra large cats you may have to look for something special. Measuring your cat for a collar is a necessity to ensure the collar won’t simply slip off at any point and also to make sure it won’t choke your cat. Cats are also rather resourceful when it comes to their own comfort and you don’t want them to be able to easily shove the collar off. The market is loaded with pet products, in particular about 1000 different variations of cat collars. There are nylon, leather, personalized, standard, accessorized, etc. The list goes on and on. Each type of collar has advantages and disadvantages worth considering. No matter which path you choose you should aim to include the personal details of your cat on their collar to ensure they find their way home quickly and easily in the event of an escape. You should also ensure your selected collar has a safety release just in case your cat gets into a sticky situation and the collar gets caught on something. There are several kinds of safety releases, just be sure to choose a collar with one. Note every collar on this page has a safety mechanism. Don’t be afraid to try multiple types of collars! Some may irritate your cat far less than others and some are more effective for being seeing in the dark than others. 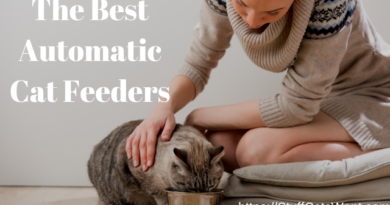 There are a bunch of options and you should choose what’s right for your cat based on their personality and behavior. If you keep a collar on your cat and it has personal details tell us which one it is below! If you’re having trouble getting your cat to wear a collar let us know too by leaving a comment below. I was pretty awed by that one as well. I suppose if you really want to bling out your kitty that’s the way to go! This is an eye opener article. I did not know there are that many different collars available for cats. They all look so adorable. I’m definitely going to get the Kitty Convict one for my cat cause she is indoor only but she loves racing for open doors. Great! That’s an excellent choice. It is super visible and I personally just love the color orange. Such a detailed article on cat collars, it’s impressive! I found it just in time. My best friend got herself a cat, but she doesn’t have a collar yet. Wonderful! Be sure to add the name and the phone number on whichever one you purchase. That’s quite a collection of belts and tags. The belts have certainly changed since I first had cats. I just had a plain one for mine many years ago. It’s great that the name of the cat and phone number can be put onto the belt. Also, I like that they can be clipped on to your cat, rather than like a normal belt with holes. I’m looking to get a collar now for my cat and to be honest I’m liking the leather ones. Very stylish. Yeah, I love that leather collar too. It looks great, it is durable, and it comes with all the necessaries to keep your fur ball safe if they get outside. The biggest issue you normally run into with leather collars is that they don’t have a safety release. This one is unique and that’s why I put it at #1! All cats are natural explorers, and if you live in a house, not an apartment, then your cat will go out. Personalized cat collards are great and every cat should wear one, most cats will get lost at some time of their lives and a collar with the owner information printed on it is the best chance for your pet to return home safely. Seems we are in close agreement, thanks for your comment! As you may already be aware, Craig, I am primarily a dog woman, although I love cats too. I find the idea of embroidering your cat’s details on his or her collar absolutely brilliant. And of course, I do love the glittery ones. You mention the reticence by cat owners sometimes in wanting to wear a collar on their cats for fear that the cats may not like it or just because they are indoor cats. I’m wondering whether there is a law for cats, as there is for dogs, which makes it compulsory for the owner to wear a collar on their cat with an ID tag. This would be purely to make it easier for cats to be rejoined to their owners in case they get lost. Can you advise on this? I know that cats are more ‘street wise’ than dogs, but cats too unfortunately can get lost. I absolutely love the picture you have used at the top of your page – those eyes! The safety release feature is really important when purchasing a collar. Cat are always climbing all over the place and can easily get caught up. I do like the idea of having a number printed directly on the collar so that it is easy to see. This way if your cat is lost and scared, the people trying to help it don’t even need to come into contact with the cat. Hahaha, lucky me many cat photographers are willing to share their photos free of charge. While microchips are awesome identifiers and can’t fall off I feel like the most direct route to safety is always the best! 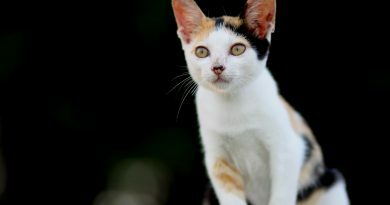 Wow what a great article that’s packed with information and a must read for all cat owners in the market for a collar. I myself have 3 cats and will be switching their collars over to one of these break away ones. Glad you found it useful and thanks for reading. The break away really is a nice feature, especially if you’ve got a kitty known for jumping all over the place or exploring all the time!